Apparently it’s blueberry season. At least I keep hearing about people going blueberry picking. Doesn’t that sound fantastic? I’m sure it’s just a lovely thing to do. I for one don’t really want to leave the house unless it’s for something that I either have to do or that will be definitely worth the heat. Namely, it has to be guaranteed to entertain all of my children in order to be worth it. I just don’t think that blueberry picking is on the list this year. This pregnant mama prefers the air conditioning or the pool. But we did buy some fresh blueberries! And on one of those rare cooler mornings, I took advantage and turned on the oven. And it was so worth it. My kids even ate the blueberries in the oatmeal blueberry cookies! There was no picking. They inherited my weirdness with fruit in baked goods (we all love fresh fruit of most varieties, but not when it’s IN something or gets gooey). It helped that the blueberries stayed mostly whole and they just added so much to the taste of the already yummy oatmeal cookies. 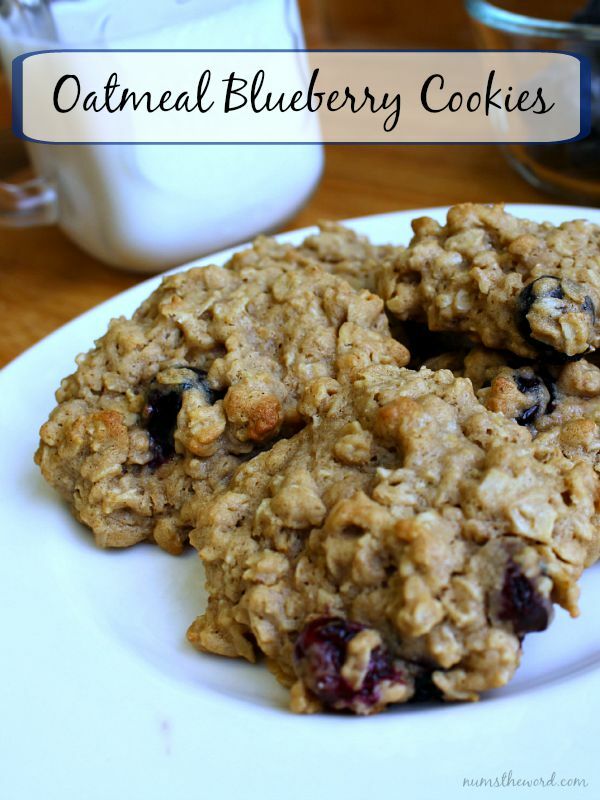 We will definitely be making these oatmeal blueberry cookies again soon, maybe on a rainy afternoon. Preheat oven to 375 degrees. Line a baking sheet with parchment paper or silicone liner, set aside. Cream butter and brown sugar in bowl of stand mixer until light and fluffy. Add the oats, flours, baking soda, salt, cinnamon and nutmeg to the bowl and mix in together until combined. Drop dough by large tablespoonfuls onto the prepared baking sheets. 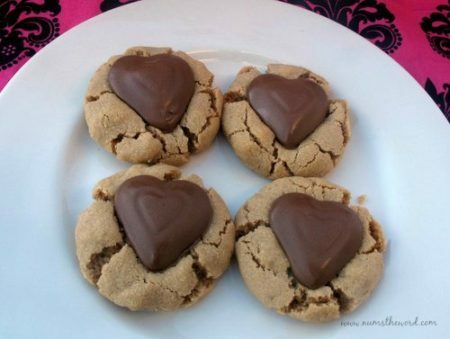 Bake for 10-12 minutes or until the cookies become light golden brown around the edges. Allow them to rest for 1-2 minutes before moving to cooling rack. If you like mint and chocolate, have we got a cookie for you. 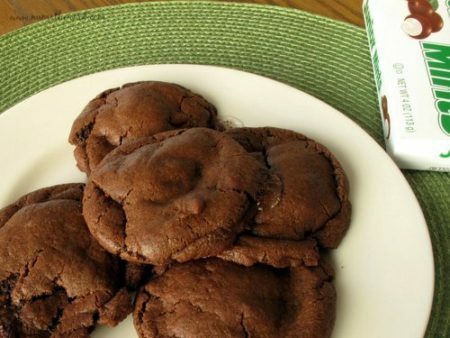 Chewy chocolate cookies with the goodness of Junior Mints baked inside! 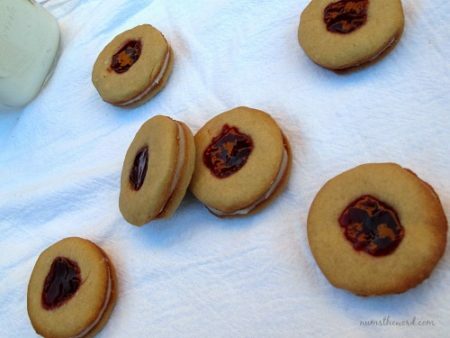 The flavor in these sandwich cookies are just so good! They are some of our most favorite cookies. They take a bit of effort, but are SO worth it! Thanks for the yummy oatmeal/blueberry cookie recipe! It’s on my ‘to bake’ list! I love the ‘twist’ of fresh blueberries in the cookies! Enjoy your day!